This is literally the dumbest move to reform the brand's image. First the wreath got an awkward stretch. Now they go even more generic and nondescript. Cadillac's cars are starting to be 'same sausage, different length' like the Germans. I just don't understand how they could completely abandon some of the beautiful names from the past as well as some of the more modern concepts. Given that the CT6 is reported to be slightly bigger than the CTS but not S Class sized...I wonder if this is really the new "CTS" i.e. competing with the 5 Series and E Class with a car that is slightly larger. Could an ATS/CTS replacement come as a large than 3 Series vehicle but aimed at the 3 series as was the first CTS? This could be a great strategy given that the CT6 is NOT the flagship and that a real flagship is coming. their website describes the CT6 as the flagship top of the range sedan, which will have to have a big enough gap to give the CTS room. The original CTS made sense as a 3/5 series fighter because they didn't already have a car in each segment. I'd assume this is at least as big as a SWB S class. Some reports are that it isn't. From various reports that exist, the CT6 is very much in the vein of how the defunct STS related to the CTS i.e. larger but not S Class large. Obviously when the CT6 arrives it will be their "top of range" sedan, but that may not mean it will be a true S-Class competitor especially since de Nysschen has been talking about a model above the CT6. The lack of pictures of the prototype on the road with the cars its benchmarking is also odd. According to reports, it was said by a GM exec that the upcoming CT6 will be 8" longer than the CTS, and the CTS is 195.5" in overall length, so it looks to wind up at around 203-204" in length, which places the CT6 in between the sizes of the S-Class and competitor's regular and long-wheelbase models. That even makes it around the size of a Hyundai Equus. At first, I was let down that what was billed as the flagship was only going to be that size, where I expected something bigger. However, it was then later confirmed that the larger true flagship above the CT6 is on deck (CT8? ), that added more fulfillment. I can see the CT8, or whatever it may be billed as according to the new naming-convention, perhaps being a good 210" in length, or close to a Rolls-Royce Ghost regular-wheelbase sedan. 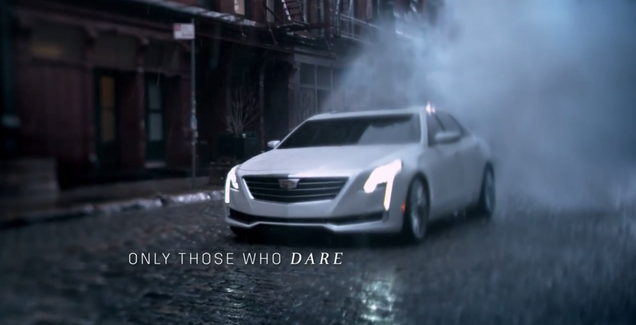 Cadillac wants to tread those top-tier waters, but, that would be well into the next decade. Looks as we expected pretty much, like a larger ATS/CTS, but the headlight shape is interesting. Last edited by pjl35; 02-23-2015 at 03:06 AM. Looks fine....More than competitive for this category. The headlights look nice - but the tail looks long / over pronounced (a GM trait it seems...Impala, CTS, XTX, etc). Curious to see what the interior holds for us. 2) Consumers press pause, go to the washroom and fast forward through the commercial when they get back. Last edited by Crash; 02-23-2015 at 01:14 PM. I'm beginning to think that the ONLY way the CT6 will make it is if it replaces the CTS all while keeping the CTS price point. The ATS-L available in China needs to replace the ATS. Both the ATS and CTS are too tight in the back seat. I was just at the Toronto auto show and found the CTS to be fine in the back seat (I'm 6'2). I don't think it needs to replace the CTS - that's their 'volume car' - but think the CTS has gotten too expensive for what it is. I'm not sure of the product positioning between this and the XTS though...to me, this new rig competes more w/ that product. The ATS is too small in the back seat - but it's in line w/ A4 / 3 series for space.